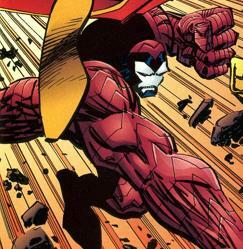 Overpower sought to prove that he was worthy of Mighty Man’s title of the “World’s Mightiest Man” and so challenged the hero to a fight. During the resulting battle, a young woman named Margo Silva was injured by falling debris. Mighty Man quickly defeated foe for Dragon to take into police custody, enabling him to get Margo to seek medical treatment at Hillman Hospital.